The Treaty of Guadalupe Hidalgo is ratified by the United States Senate which ends the Mexican–American War. California and New Mexico were quickly occupied by American forces in the summer of 1846, and fighting there ended on 13 January 1847 with the signing of the “Capitulation Agreement” at “Campo de Cahuenga” and end of the Taos Revolt. By the middle of September 1847, U.S. forces had successfully invaded central Mexico and occupied Mexico City. Some Eastern Democrats called for complete annexation of Mexico and claimed that some Mexican liberals would welcome this, but President Polk’s State of the Union address in December 1847 upheld Mexican independence and argued at length that occupation and any further military operations in Mexico were aimed at securing a treaty ceding California and New Mexico up to approximately the 32nd parallel north and possibly Baja California and transit rights across the Isthmus of Tehuantepec. Despite its lengthy string of military defeats, the Mexican government was reluctant to agree to the loss of California and New Mexico. Even with its capital under enemy occupation, the Mexican government was inclined to consider factors such as the unwillingness of the U.S. administration to annex Mexico outright and what appeared to be deep divisions in domestic U.S. opinion regarding the war and its aims, which gave it reason to conclude that it was actually in a far better negotiating position than the military situation might have suggested. A further consideration was the Mexican government’s opposition to slavery and its awareness of the well-known and growing sectional divide in the U.S. over the issue of slavery. It therefore made sense for Mexico to negotiate with a goal of pandering to Northern U.S. interests at the expense of Southern U.S. interests. The Mexicans proposed peace terms that offered only sale of Alta California north of the 37th parallel north — north of Santa Cruz, California and Madera, California and the southern boundaries of today’s Utah and Colorado. This territory was already dominated by Anglo-American settlers, but perhaps more importantly from the Mexican point of view, it represented the bulk of pre-war Mexican territory north of the Missouri Compromise line of parallel 36°30? north — lands that, if annexed by the U.S., would have been presumed by Northerners to be forever free of slavery. The Mexicans also offered to recognize the U.S. annexation of Texas, but held to its demand of the Nueces River as a boundary. While the Mexican government could not reasonably have expected the Polk Administration to accept such terms, it would have had reason to hope that a rejection of peace terms so favorable to Northern interests might have the potential to provoke sectional conflict in the United States, or perhaps even a civil war that would fatally undermine the U.S. military position in Mexico. Instead, these terms combined with other Mexican demands only provoked widespread indignation throughout the U.S. without causing the sectional conflict the Mexicans were hoping for. The Treaty of Guadalupe Hidalgo was signed by Nicholas Trist and Luis G. Cuevas, Bernardo Couto and Miguel Atristain as plenipotentiary representatives of Mexico on 2 February 1848, at the main altar of the old Basilica of Guadalupe at Villa Hidalgo as U.S. troops under the command of Gen. Winfield Scott were occupying Mexico City. The version of the treaty ratified by the United States Senate eliminated Article X, which stated that the U.S. government would honor and guarantee all land grants awarded in lands ceded to the U.S. to citizens of Spain and Mexico by those respective governments. Article VIII guaranteed that Mexicans who remained more than one year in the ceded lands would automatically become full-fledged United States citizens; however, the Senate modified Article IX, changing the first paragraph and excluding the last two. Among the changes was that Mexican citizens would “be admitted at the proper time” instead of “admitted as soon as possible”, as negotiated between Trist and the Mexican delegation. 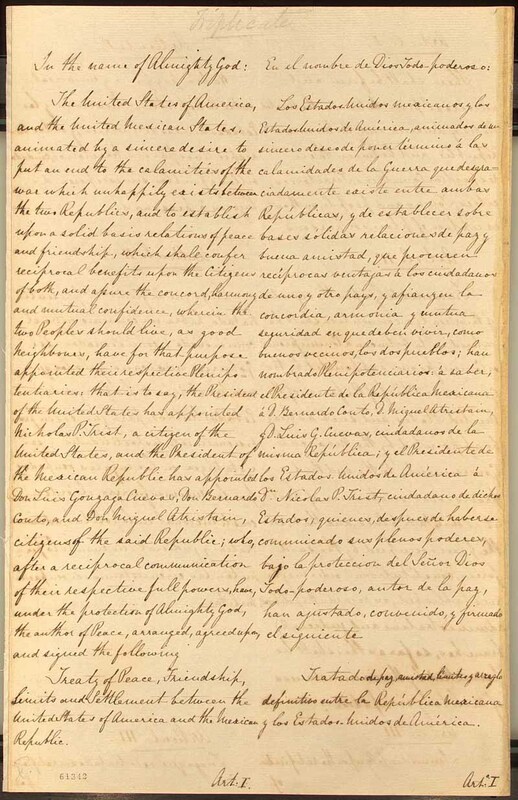 An amendment by Jefferson Davis giving the U.S. most of Tamaulipas and Nuevo León, all of Coahuila and a large part of Chihuahua was supported by both senators from Texas, Daniel S. Dickinson of New York, Stephen A. Douglas of Illinois, Edward A. Hannegan of Indiana, and one each from Alabama, Florida, Mississippi, Ohio, Missouri and Tennessee. Most of the leaders of the Democratic party, Thomas Hart Benton, John C. Calhoun, Herschel V. Johnson, Lewis Cass, James Murray Mason of Virginia and Ambrose Hundley Sevier were opposed and the amendment was defeated 44–11. A motion to insert into the treaty the Wilmot Proviso failed 15–38 on sectional lines. The treaty was subsequently ratified by the U.S. Senate by a vote of 38 to 14 on 10 March 1848 and by Mexico through a legislative vote of 51 to 34 and a Senate vote of 33 to 4, on 19 May 1848. News that New Mexico’s legislative assembly had just passed an act for organization of a U.S. territorial government helped ease Mexican concern about abandoning the people of New Mexico. The treaty was formally proclaimed on 4 July 1848. 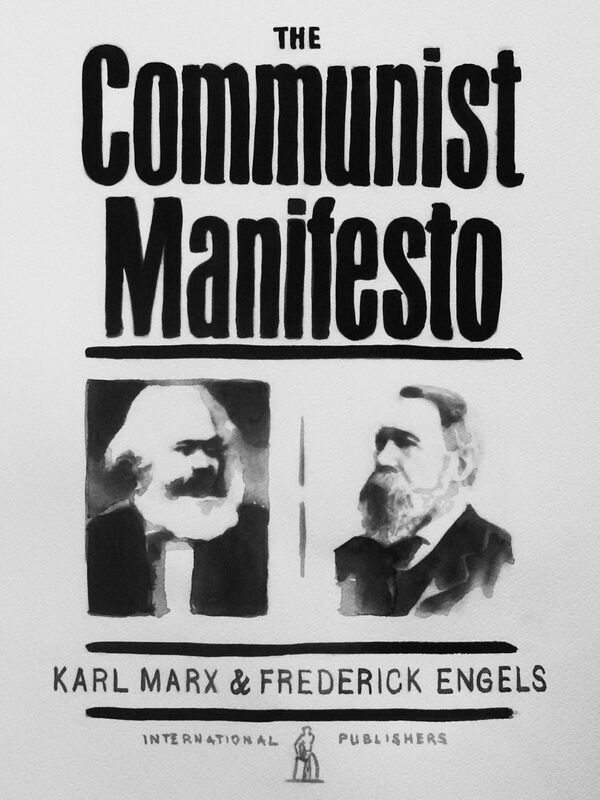 On February 21, 1848, The Communist Manifesto, written by Karl Marx with the assistance of Friedrich Engels, is published in London by a group of German-born revolutionary socialists known as the Communist League. The political pamphlet–arguably the most influential in history–proclaimed that “the history of all hitherto existing society is the history of class struggles” and that the inevitable victory of the proletariat, or working class, would put an end to class society forever. Originally published in German as Manifest der Kommunistischen Partei, the work had little immediate impact. Its ideas, however, reverberated with increasing force into the 20th century, and by 1950 nearly half the world’s population lived under Marxist governments. 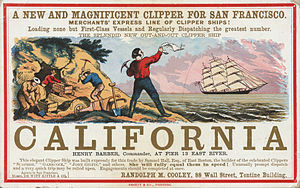 James Marshall finds gold at Sutter’s Mill near Sacramento starting the California Gold Rush. The “start” of the California Gold Rush. In a message to the United States Congress the President, James K. Polk confirms that large amounts of gold had been discovered in California starting the California Gold Rush. The June Days Uprising in Paris ends. 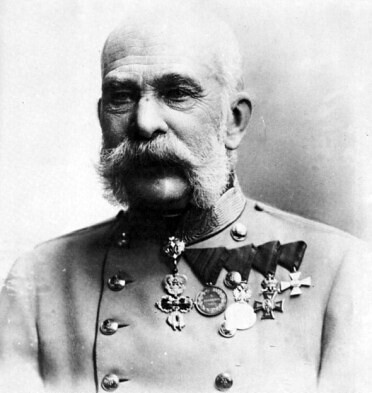 In Hungary, the Habsburg rulers are compelled to meet the demands of the Reform party; sparking the Hungarian Revolution.